The RM Sotheby’s auction had a late afternoon start on Friday August 24th and then continued the following day, again with a 5.30 p.m. start. 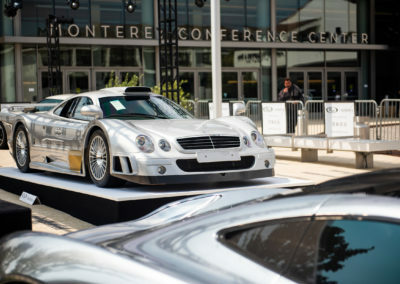 The event’s very rich catalog included 175 cars, 68 of which were offered without a reserve price. Ferrari was the brand most strongly represented, with 29 cars offered, followed by Porsche, with 18 (including two RUFs). There were 33 cars with estimates above the USD one million dollar mark including four with estimated values in excess of USD 2 million, a further two predicted to fetch in excess of USD 3 million, and four estimated to be worth in the region of USD 4 million. One car was valued at USD 7 million, two at 9 million, one at 18 million, and one at an eye-watering 45 million. Added to these was the car that, as expected, turned out to be the real star of the sale, and of the Monterey Week sales generally. I am referring, of course, to the 1962 Ferrari GTO that had been assigned a record-breaking upper estimate of USD 60 million, and ended up changing hands for USD 48,450,000, still within its predicted range (45–60 million). At the other end of the spectrum, the car with the lowest pre-sale estimate, which as predicted, become the sale’s cheapest lot, was a 1987 Porsche 944S. In this case, however, the car failed to reach its expected value (USD 30,000), coming under the hammer at just USD 22,400. All the prices given in this report are inclusive of the buyer’s premium. Four of the six cars we featured in our preview of this auction found new owners. 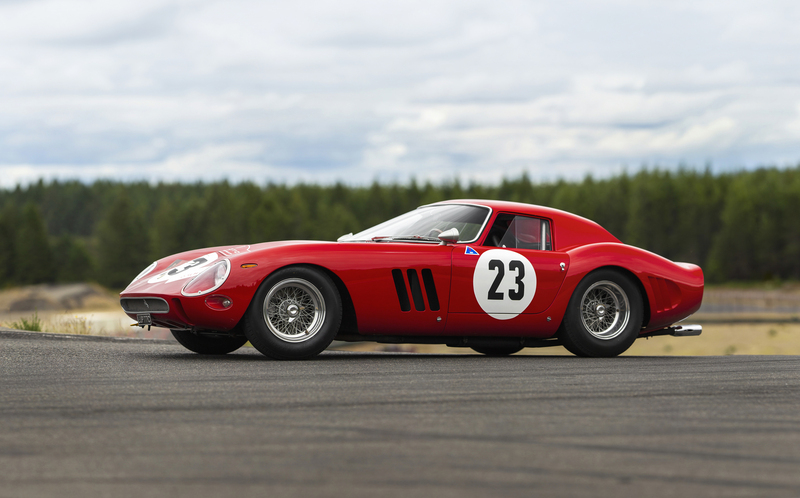 As mentioned, the fabulous 1962 Ferrari 250 GTO, offered with an estimate of USD 45–60 million USD, sold for 48,450,000. The third GTO of the only 36 built, it was undoubtedly the star attraction of Monterey Week, generating extensive media coverage the world over. Still fitted with its original matching numbers engine, it boasts an impressive palmares that includes victories in the Targa Florio and GT Championship. The Ford GT 40 MKII, which has important links with the Le Mans 24 Hours, came under the hammer at USD 9,795,000 after a presale estimate of USD 9–12 million. Indeed, as the FoMoCo team car, it came 3rd overall at Le Mans in 1966 and 1967. Another of our selected six, the 1998 Mercedes-Benz AMG CLK GTR, with an estimated value of USD 4.25–5.25 million, fetched USD 4,515,000 (6% less than predicted). Although 300 orders were placed for this model, in the end, only 25 were built in total: 20 with a coupé and five with a spider body. Completely original in every major component, paint included, this car has covered a mere 1500 miles. Another of our pick that sold just short of its presale estimate (USD 2.2–2.4 million) was the 1971 Lamborghini Miura SV, which came under the hammer at USD 2,144,500. This car is one of just 150 produced in the SV (Spinto Veloce) version, and this particular one incorporates all the improvements introduced during the time the model was in production. A fully documented history and the presence of the all-important air conditioning (a rare optional) make this SV a very interesting purchase indeed. Our other two selected cars, namely the 1968 Porsche 908 short tail ex-works and the 1933 Rolls-Royce Phantom II FHC, were both no sales. This sale’s top-selling car was among our “selected six”, as were the ones that took the third, sixth and ninth slots (respectively, the Ford GT 40 MKII, the Mercedes-Benz AMG CLK GTR, and the Lamborghini Miura SV). Therefore, we here look briefly at the other six that made it into the Top Ten. 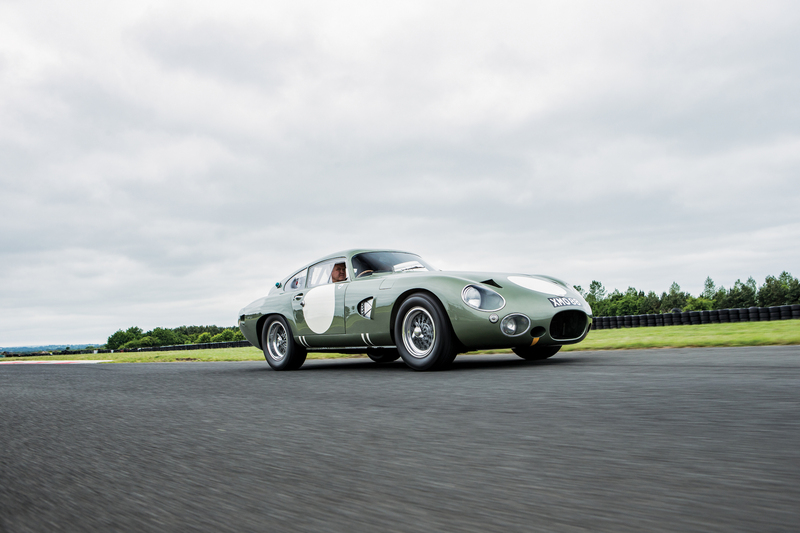 Fitted with its original engine, a correct-for-type five-speed gearbox, and its original works-built Hiduminium body, this car (chassis # DP215) is an important part of Aston Martin racing history. Moreover, it is easy to drive at low speeds in modern traffic conditions, as its previous owner once found out for himself when, attending an event in Paris, he found himself caught up in a snarl-up in the French capital. (This car had been assigned as estimated value of USD 18–22 million). As documented by numerous photos and race programs, this car (chassis # 550A-0116) was driven in period by leading West Coast racing personalities. After being comprehensively restored, in Germany, by marque experts, it won its class at the 2014 Amelia Island Concours d’Elegance. In Monterey, it sold for 6.5% more than its lower estimate. (Estimated value USD 4.6–5 million). This car (chassis # 2124) is the eleventh of the twenty Zagato-bodied Berlinettas built, and also one of the 60 twin-plug A6G/54 examples. Featuring unique coachwork, including an unusual and charming grille, it still retains its original factory-issued engine and gearbox. It competed at the 1956 Mille Miglia, whereas in recent years it won its class both at the 2014 Pebble Beach Concours d’Elegance and at the 2015 Villa d’Este Concorso d’Eleganza. (Estimated value: USD 4.25–5.25 million). Offered from a highly reputable collection, this Packard (chassis # 1108-65) was awarded Best in Show at the 2013 Pebble Beach Concours d’Elegance and the 2016 Concours d’Elegance of America at St. John’s. Moreover it was featured as poster car at the 2015 Elegance at Hershey. 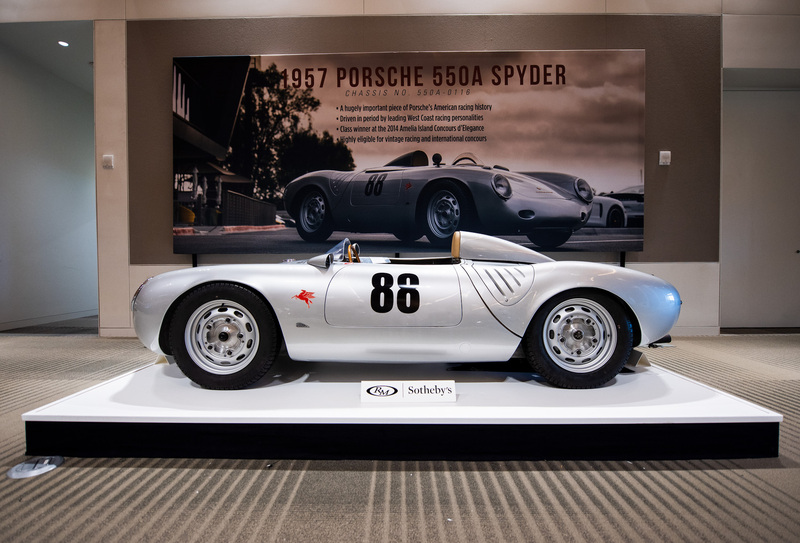 The original chassis, engine and steering box, and the De Dietrich body, together with the car’s history, make it a truly unique purchase (Estimated value: 4.5–6 million USD). One of the 499 produced in total, this car (chassis # ZFF76ZFA8E0206449) was offered without reserve from a private collection. Still with a clock reading of just 100 miles, this car, surely Ferrari’s most iconic 21st Century hybrid hypercar, may be considered virtually new. It sold for 10% more than its lower estimate. (Estimate: USD 3.0–4.0 million). Offered without reserve from a private collection, this car (chassis # 198.042.10.003116) is a late-production example featuring the alloy engine block and disc brakes. It sports a very rare factory black-on-black color combination. The final price was pretty close to its upper estimate. Indeed, it is a very good car which showed that quality pays (Estimate: USD 1.65–2.0 million USD). Surprisingly, one of the most interesting cars offered at the sale, a 1962 Ferrari 250 SWB, failed to sell. 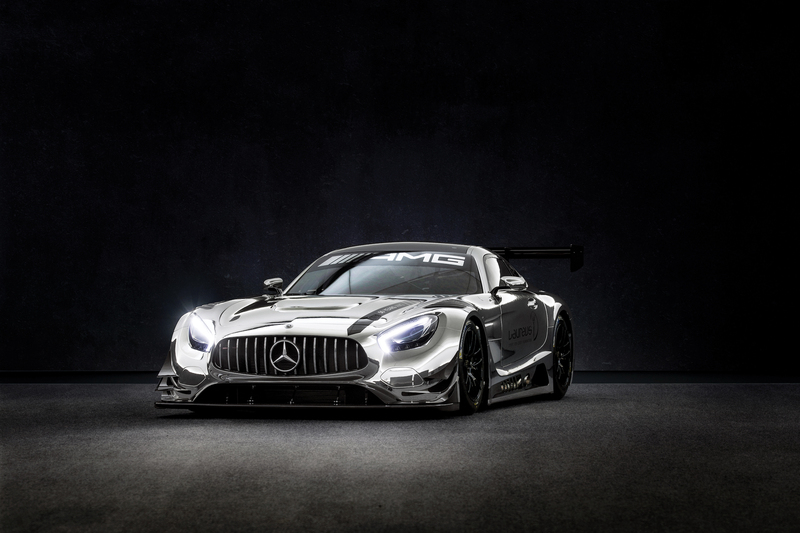 Among the cars offered without reserve, a 2017 Mercedes-AMG GT3, with an estimated value of USD 400–600 K, was sold for 885,000 USD, 121% more than its lower estimate. At the other end the scale, a 1961 Cooper-Climax T54 fetched 44% less than its lower estimated value, selling for USD 280,000 instead of USD 500–600 K, while a 1953 Chevrolet Corvette sold for USD 184,800, 33% less than its lower estimate of USD 275 K.
All photos courtesy of RM Sotheby’s. 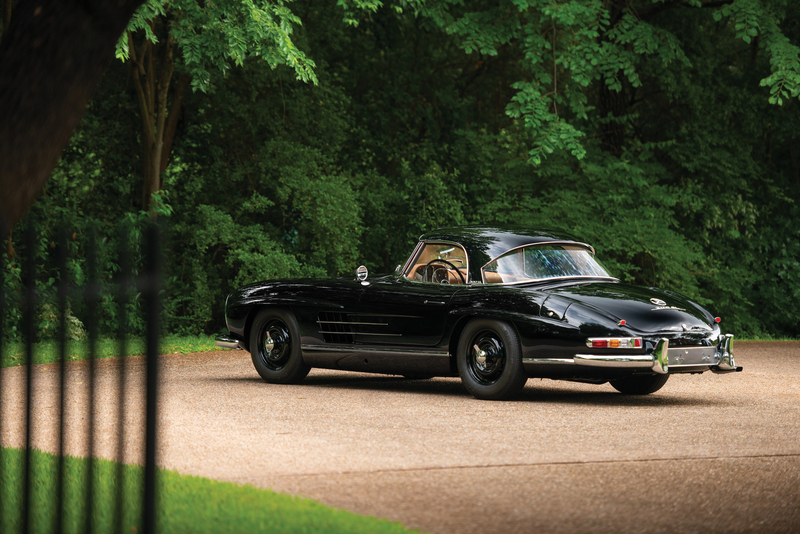 Photo of MB 300 SL copyright Darin Schnabel, AM by Simon Clay.